As the seasons change, so do our wardrobes. And for the well-dressed gentleman, this also means donning the right watch for fall. While summer attire is typically more relaxed and carefree, fall takes on a more structured and dressier approach. To complement the leathers, suedes, warm tones, and tailored fall wardrobe, opt for a luxury watch that wears well with both casual gear or more formal wear. 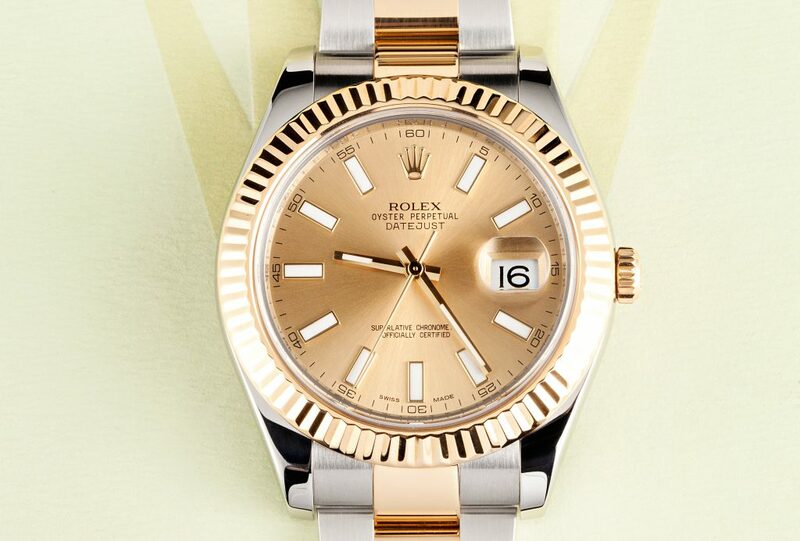 And the Rolex champagne Datejust II is just the right watch for the style job. Although dressier than a Rolex Submariner, Daytona, or GMT-Master, the mens two tone Datejust II is also sporty thanks to its larger size, thicker case, and wider bezel. Therefore, it’s a fantastic luxury timepiece that can seamlessly go from the office to weekend downtime. The Rolex champagne Datejust II ref. 116333 is a two-tone model. Sporting a 41mm case, it’s notably larger and bulkier than the traditional 36mm Rolex Datejust. The fluted bezel, crown, and center links on the stainless steel case and body are constructed of 18k yellow gold, thus adding a luxurious touch to the timepiece. The champagne dial matches flawlessly with the gold accents on the case and bracelet, while also allowing the luminous hour markers on the dial to pop. 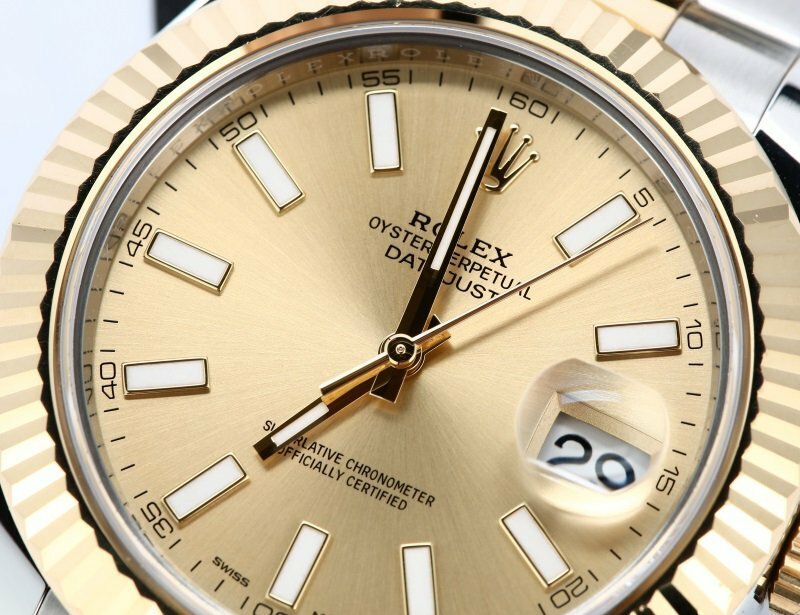 Characteristic of the Datejust collection is the date aperture at the 3 o’clock position magnified by the famed Cyclops lens. Furthermore, the scratchproof sapphire crystal protects the face of the dial. 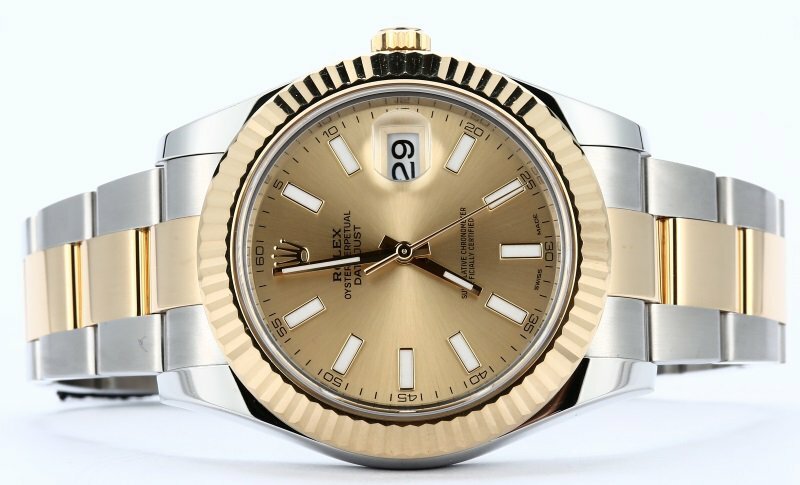 Since the Rolesor champagne Datejust II ref. 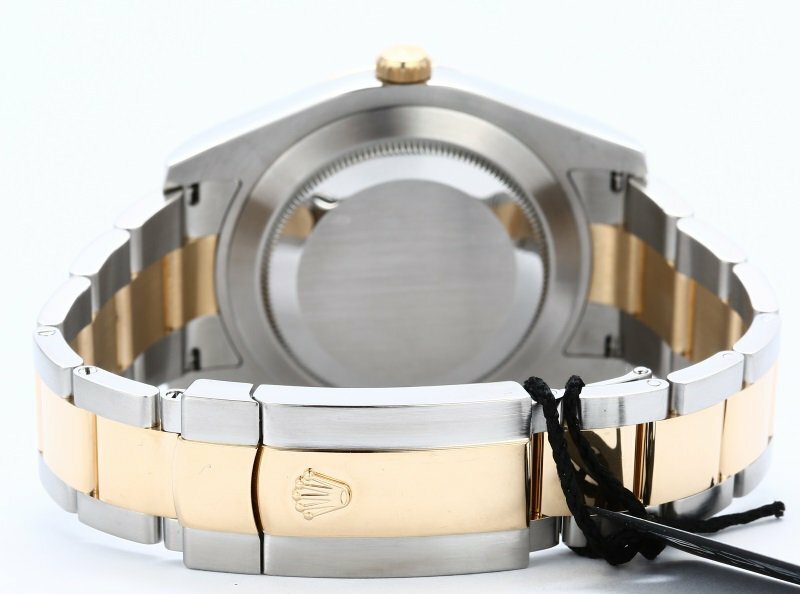 116333 is a newer model from Rolex, it features the engraved “ROLEX ROLEX ROLEX” rehuat as a measure against counterfeiting. Powering the trio of center hands and date function is the resilient Caliber 3136 automatic movement. Safely tucked behind the watertight Oyster case with its screw-down winding crown and caseback, the self-winding movement will continue to work as deep as 330 feet (100 meters) underwater. Rounding out the practicality of the 3136 caliber are the Quickset and Hacking features. The supremely comfortable and robust Oyster bracelet looks particularly appealing with its stainless steel and 18k yellow gold configuration. The 18k yellow gold polished center links are an attractive contrast to the brushed stainless steel outer links. Finally, the two-tone bracelet is outfitted with the folding Oysterclasp for added comfort and security. As the weather cools down and your clothing gets thicker and more luxurious, pull your fall look together with a two-tone Datejust II. Always appropriate, the champagne dial and marriage of yellow gold and steel will match almost anything in your colder weather wardrobe.